We’re delighted to welcome our new Web Applications Specialist, David McClure, to the Scholars’ Lab R&D team. David graduated from Yale University with a degree in Humanities in 2009, and has been working as an independent web developer in San Francisco, New York, and Madison, Wisconsin for the last few years. David is the creator of Public Poetics, an elegant PHP interface for collaborative, web-based commentary on poetry. He characterizes this project as a design experiment in addressing “a problem of content ‘over-accumulation’ that tends to plague many existing systems of textual annotation and commenting.” Not only does David have a strong aesthetic sense and background in web application development, he also has experience in computer graphics, having worked with graphics libraries while developing software for the Cognitive Science department at Yale. David is also an avid outdoorsman. 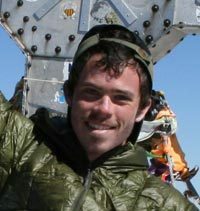 His essay “Mountain Magic on the Pyrenean High Route” was published in Backpacking Light online. David McClure will start with us in late May, and we’re excited to bring him on as a collaborator! Cite this post: Wayne Graham. “Welcoming David McClure!”. Published May 02, 2011. https://scholarslab.lib.virginia.edu/blog/welcoming-david-mcclure/. Accessed on .